Aged & Selected (AS) Lamp Option: These Lamps are aged a minimum of 16 hours at rated voltage and selected for MSCP (Brightness) tolerance prior to shipping. 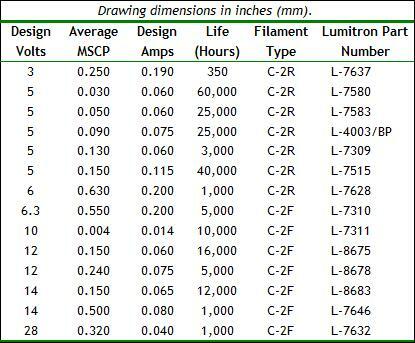 Please designate your selection of this option by adding AS, and the MSCP tolerance, to the part number. Example: An L-715 aged and selected to a plus-or-minus brightness tolerance of 15 percent becomes an L-715-AS15. Finish: Pins are gold plated .00020 min. 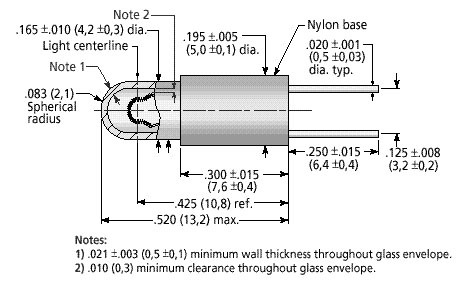 per MIL-G-45204 unless unfinished nickel pins are specified. 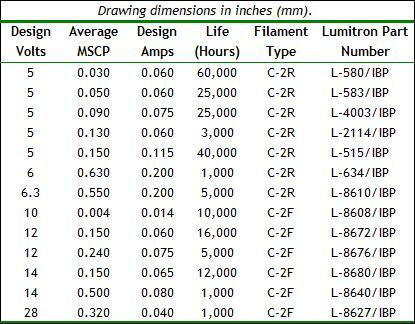 For pins tinned per MIL-STD-202, Method 208, add TPL to part number. Finish: Pins are tinned per MIL-STD-202, Method 208. For gold plated .00020 min. per MIL-G-45204, add GPL to part number.